It has been fifty (one) years since the publication of E.P. 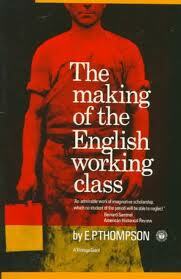 Thompson’s epic The Making of the English Working Class. I have posted thoughts on its status in American sociology at Mobilizing Ideas. (also below) Doing so was kind of odd. I don’t really use Thompson much anymore. However, The Making was a book that was very inspirational when I was young and both shaped my orientation to popular politics and academic research. Nonetheless, it is hard to pin down how it is or should be significant for American sociologists today. It certainly has value for social historians and as a tremendous literary achievement. But Thompson’s conceptualizations and approach to the analysis of class and popular politics have mostly been rejected by American sociologists (with some important exceptions). In 1963 an obscure Marxist press published The Making of the English Working Class by Edward Palmer Thompson, an adult educator and one of the intellectual founders of the British New Left. By the time Thompson died thirty years later, Eric Hobsbawm, Thompson’s one-time colleague in the post-war Communist Writers Group, noted that he was one of the 250 most-cited authors of all time and was the most-cited 20th-century historian in the world. The book is epic in scope. Thompson traverses the period between 1789 and 1832 to recover popular traditions and the gradual formation of working-class consciousness. It is an original and much needed account of the industrial revolution from the perspective of the English people. The Making transformed the discipline of history and influenced the post-sixties generation of historical sociologists as they rebelled against the consensus and modernizing theories that had dominated sociology. In the golden anniversary year of its publication, reassessments of the book and its author were commonplace in the British press. In contrast, Thompson and the book are mostly forgotten in American sociology. Why? A few key claims held together the sprawling narrative. First, the collective subjectivity that was being created was working class. Second, class is primarily defined in terms of identity and consciousness, not structural position. Third, class formation depends on “experience,” by which Thompson meant the experience of exploitation and political contention, but more importantly, the cultural framework through which those experiences were understandable and meaningful. Finally, Thompson makes a methodological argument about the importance of “recovery”—if we are to appreciate the importance of history’s losers we must actively endeavor to recover the possibility in their activity in order to appreciate it as a reasonable response to crisis rather than as a deluded struggle against a historical transformation which, in retrospect, was inevitable. Based on this, Thompson argues that English democracy was saved from the depredations of elites by the working class even though it lost its struggle against capitalism. Most of these arguments were directed against Stalinists, structural academic Marxists, and professional British historians who narrated the industrial revolution based on material standards of living. But Thompson’s opponents were different from those of American social movement and historical sociologists in the 1970s and 1980s. The latter were grappling with Parsons, modernization theory, positivism, and a hostility to interpretation. With such opponents Thompson’s arguments about class and agency were mostly beside the point. Thompson’s recovery of popular culture and tradition argued for a practically-reasonable account of contentious action that gave full rein to emotion, tradition, and the uglier side of working-class collective action. In contrast, in the United States coping with established collective behavior theories put the emphasis on the strategic rationality of social movement actors. Likewise, Thompson’s insistence on the “discipline of historical context” in recovering popular traditions and practices stood in the way of generalizing from cases to concepts and theories. While Thompson’s approach and insights, particularly his emphasis on writing history “from below”, certainly influenced some social movements scholars like Charles Tilly, Aldon Morris, Ronald Aminzade, Craig Calhoun, and William Sewell, the development of social movement theory and method moved against the grain of The Making, becoming more abstract, generalizable, elite-centric, and resting on a strategically-rational account of action. Given the relatively poor fit between Thompson’s central claims in The Making and the needs of historical and social movement sociologists, is there any reason for sociologists to reconsider The Making today? I think there are three such reasons. First, Thompson’s recovery of popular practices and discourses shifts our understanding of class dominance and hegemony from one that paralyzes people except in moments of “political opportunity” to one that sees elite dominance as provisional and contingent. Of course, popular political culture today doesn’t have much in common with early nineteenth-century England, but a similar point is made, albeit abstractly, by critical theorists like Michael Hardt and Antonio Negri. Second, Thompson’s account of action shares much in common with Bourdieu’s (indeed, they seemed to regard one another highly). The difference is that Thompson was dismissed by critics for being overly voluntaristic while Bourdieu was criticized for overemphasizing reproduction and hegemony. When we view them together, it is possible to see that neither voluntarism nor determination are necessarily outcomes of an analytical emphasis on practical action. Third, Thompson’s title indicates an important theoretical and historical argument. The working class was “made” through the action of the working class itself. It built institutions, networks, discourses, repertoires, and practices that eventually permeated the whole of British society. Class society and indeed democratic society were likewise created through working class action. There was no prior model for this; it was an act of collective popular creativity. We rarely treat popular politics as having this sort of creative potential, much less analyze these emergent qualities. In a moment when politics seems so devoid of democratizing potential we could do worse than recall that it was not always so.